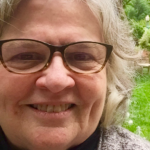 Denise Ann Terry came to the Episcopal Church from a Roman Catholic tradition (educated in Catholic schools from first grade through Albertus Magnus College, class of 1968). Growing up in New York’s Hudson Valley, she was active in 4-H and Girl Scouts. Denise’s professional life has been dedicated to education, as a classroom teacher and a tutor. She and her husband have been at St. Thomas Parish since November of 2015, having moved to a New Haven apartment to be near their daughter Amy Sheehan and her family. She continues to spend summers in Falmouth, MA. In New Haven, Denise tutors at New Haven Reads, teaches Sunday School at St. Thomas, and shelves books at the Day School. Don and Denise have four daughters and six grandchildren.